Nandos Restaurant joined our Mission to help provide access to “Clean Water for All by 2030”. This Mission was initiated by the United Nations. A big thank you to Nandos Restaurant’s team and customers for joining this extremely important mission on 01 May 2018. Our mission is clear… we’re the ones who fire it up! Nando’s Original is the space for Nando's friends, fans and addicts to share ideas, check out iconic Nando’s ads, competitions, news and the occasional fiery social comment, of course. 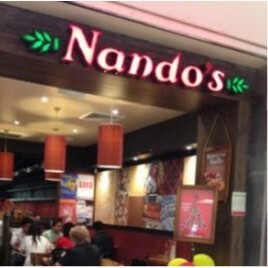 The name Nando's comes from Fernando, the name of one of the founders of the chain - Fernando Duarte. He and a friend, Robert Brozin, bought a restaurant called Chickenland in Rosettenville, near Johannesburg in 1987. This became the first Nando's restaurant, which incorporated influences by former Portuguese colonists from Mozambique, many of whom had settled on the south-eastern side of Johannesburg. As a result, Nando's is sometimes still referred to as Nando's Chickenland.